Rob Bell’s book Love Wins stirred up something of a hornet’s nest of controversy among “evangelicals” when it was published in 2011, which we found puzzling. The man had been denying eternal hell and teaching a universalistic faith for a long time. In his influential book Velvet Elvis, which is popular with a great many Southern Baptists, he described a wedding that he conducted for two pagan unbelievers who told him that “they didn’t want any Jesus or God or Bible or religion to be talked about” but thaey did want him to “make it really spiritual” (p. 76). Bell agreed with this ridiculous request and said that his pagan friends “are resonating with Jesus, whether they acknowledge it or not” (p. 92). Love Wins is just more of the same. Not only does he preach near-universalism, he preaches a false god, a false christ, a false gospel, a false heaven, a false hell, you name it. He is a master of taking Scripture out of context and shoehorning his heresies into a text. Though Bell has denied that he believes in universalism, he certainly makes a case for it in this book, though he might have left room for some folk to wind up for awhile in some type of hell. “This insistence that God will be united and reconciled with all people is a theme the writers and prophets return to again and again. ... The God that Jesus teaches us about doesn’t give up until everything that was lost is found. This God simply doesn’t give up. Ever” (Love Wins, Kindle location 1259-1287). “The love of God will melt every hard heart, and even the most ‘depraved sinners’ will eventually give up their resistance and turn to God. And so, beginning with the early church, there is a long tradition of Christians who believe that God will ultimately restore everything and everybody” (Love Wins, location 1339-1365). Bell even claims that Sodom and Gomorrah will be restored (location 1057-1071, 1071-1082). Bell has nothing but ridicule for the gospel that Jesus died for man’s sins and that only those who repent and believe will be saved. “What happens when a fifteen-year-old atheist dies? Was there a three-year window when he could have made a decision to change his eternal destiny? Did he miss his chance? ... What exactly would have had to happen in that three-year window to change his future? ... Some believe he would have had to say a specific prayer. Christians don’t agree on exactly what this prayer is, but for many the essential idea is that the only way to et into heaven is to pray at some point in your life, asking God to forgive you and telling God that you accept Jesus, you believe Jesus died on the cross to pay the price for your sins, and you want to go to heaven when you die. Some call this ‘accepting Christ,’ others all it the ‘sinner’s prayer,’ and still others call it ‘getting saved,’ being ‘born again,’ or being ‘converted” (Love Wins, location 129-143). “How do you make sure you’ll be a part of the new thing God is going to do? How do you best become the kind of person whom God could entrust with significant responsibility in the age to come? The standard answer was: live the commandments. God has shown you how to live. Live that way. The more you become a person of peace and justice and worship and generosity, the more actively you participate now in ordering and working to bring about God’s kind of world, the more ready you will be to assume an even greater role in the age to come” (Love Wins, location 538-565). In true heretic fashion, Bell redefines Biblical terms. “In Matthew 20 the mother of two of Jesus’s disciples says to Jesus, ‘Grant that one of these two sons of mine may sit at your right and other at your left in your kingdom.’ ... She understood heaven to be about partnering with God to make a new and better world, one with increasingly complex and expansive expressions and dimensions of shalom, creativity, beauty, and design” (Love Wins, location 630-643). “Jesus invites us, in this life, in this broken, beautiful world, to experience the life of heaven now” (Love Wins, location 798-822). “God gives us what we want, and if that’s hell, we can have it. ... There are individual hells, and communal, society-wide hells, and Jesus teaches us to take both seriously” (Love Wins, location 920-932, 1008-1020). “We need a word that refers to the big, wide, terrible evil that comes from the secrets hidden deep within our hearts all the way to the massive-society-wide collapse and chaos that comes when we fail to live in God’s world God’s way. And for that, the word ‘hell’ works quite well” (Love Wins, location 1183-1189). “Some agony needs agonizing language. Some destruction does make you think of fire. Some betrayal actually feels like you’ve been burned. Some injustices do cause things to heat up” (Love Wins, location 944-958). Bell even claims that heaven and hell are “within each other, intertwined, interwoven, bumping up against each other” (Love Wins, location 2031-2045). Bell claims that Jesus die not preach about hell in order to motivate people to be saved. “Jesus did not use hell to try and compel ‘heathens’ and ‘pagans’ to believe in God, so they wouldn’t burn when they die” (Love Wins, location 1045-1057). Bell defines the “everlasting punishment” of Matthew 25:46 as “‘a period of pruning” or ‘a time of trimming,’ or an intense experience of correction” (Love Wins, location 1056-1170). He says, “Jesus isn’t talking about forever as we think of forever” (location 1170-1183). Emergents such as Brian McLaren and Rob Bell are boldly and brashly rejecting the God of their grandparents. They are not just rejecting some doctrines their Christian grandparents believed; they are rejecting the God that their grandparents worshiped. Bell’s God is not the thrice holy Lawgiver who hates sin. As well it should if you haven’t been saved! The painting depicts the truth of the gospel. There is a heaven and there is a hell and only through regenerating faith in Christ’s cross can hell be escaped. “Are there other ways to think about heaven, other than as that perfect floating shiny city hanging suspended there in the air above that ominous red and black realm with all that smoke and steam and hissing fire? I say yes, there are” (Love Wins, Kindle location 357-368). But Bell has gone even further. He has rejected the God his grandparents worshipped. Bell claims that the God who would allow multitudes to go to eternal hell is not great or mighty (Love Wins, location 1189-1229). He calls the preaching of eternal hell “misguided and toxic,” a “cheap view of God,” and “lethal” (location 47-60, 2154-2180). He implies that this God is not a true friend and protector; he says there is something wrong with this God and calls Him “terrifying and traumatizing and unbearable” (location 1273-1287, 2098-2113). He even says that if an earthly father acted like the God who sends people to hell “we could contact child protection services immediately” (location 2085-2098). It is obvious that Bell wants nothing to do with the God worshiped by his grandparents. Bell also worships a false christ. His Jesus is “supracultural ... present within all cultures ... refuses to be co-opted or owned by any one culture ... He doesn’t even state that those coming to the Father through him will even know that they are coming exclusively through him ... there is only one mountain, but many paths. ... People come to Jesus in all sorts of ways ... Sometimes people use his name; other times they don’t” (Love Wins, location 1827-1840, 1865-1878, 1918-1933). It is not surprising, then, that Bell recommends that his readers sit at the feet of Ken Wilber, who believes in the divinity of man. “For a mind-blowing introduction to emergence theory and divine creativity, set aside three months and read Ken Wilber’s A Brief History of Everything” (Rob Bell, Velvet Elvis, p. 192). The god described in Love Wins is the very same god depicted in the novel The Shack by William Young. The book is all about redefining God. It is about a man whose becomes bitter at God after his daughter is murdered and has a life-changing experience with God in the very shack where the murder occurred; but the God he encounters is most definitely not the God of the Bible. This is precisely what the emerging church generation is doing. Richard Mouw, President of Fuller Theological Seminary, told USA Today that “Rob Bell’s newly-released Love Wins is a fine book and that I basically agree with his theology” (“The Orthodoxy of Rob Bell,” Christian Post, Mar. 20, 2011). This tells us just how terribly far Fuller Seminary has fallen from its roots in Charles Fuller’s “only through the blood” evangelistic ministry. Mouw agrees with Bell that it is wrong to say, “Accept Jesus right now, because if ten minutes from now you die without accepting this offer God will punish you forever in the fires of hell.” Mouw comments, “What kind of God are we presenting to the person?” The answer is the God of the Bible and the God that was preached by the founders of Fuller Theological Seminary. It is Bell and Mouw who have the new god. Mouw says that after a rabbi friend of his died, he “held out the hope that when he saw Jesus he would acknowledge that it was Him all along, and that Jesus would welcome him into the heavenly realm.” I’ve never read anything like that in the Bible, but C.S. Lewis taught this very thing. Mouw says that those who question Mother Teresa’s salvation just because she believed a false gospel should be ashamed of themselves. Mouw implies that Bell’s critics just want to keep people out of heaven, which is patently ridiculous and slanderous. Mouw would have us believe that he is more compassionate than Jesus, who stated very bluntly, “Except ye repent, ye shall all likewise perish” (Luke 13:3, 5). Both Bell and Mouw complain about their “critics,” but they don’t draw back from lashing out pretty fiercely at the “fundamentalists.” Bell calls hellfire preaching “lethal,” “toxic,” “unloving,” “creepy,” a “cheap view of God.” No judgmental criticism there! Nothing but compassionate, tolerant dialogue! Some of the “conservative” evangelicals are criticizing Rob Bell in a pretty strong way. John Piper tweeted, “Good bye, Rob Bell.” Albert Mohler, Jr. of Southern Baptist Seminary described Bell’s view as “Velvet Hell.” I’m glad to see a bit of backbone among some evangelicals and a level of doctrinal conviction that would drive them to actually name the name of a false teacher, but it appears very hypocritical at the same time. The view that atheists and pagan religionists might be saved without submitting to Jesus Christ is not new. Billy Graham has been saying it for decades, but I don’t recall any outcry from the evangelical world, including from Graham’s own denomination, the Southern Baptist Convention. In an interview with McCall’s magazine, January 1978, entitled “I Can’t Play God Any More,” Graham said: “I used to believe that pagans in far-off countries were lost—were going to hell—if they did not have the Gospel of Jesus Christ preached to them. I no longer believe that. … I believe that there are other ways of recognizing the existence of God—through nature, for instance—and plenty of other opportunities, therefore, of saying ‘yes’ to God.” In 1985, Graham affirmed his belief that those outside of Christ might be saved. Los Angeles reporter David Colker asked Graham: “What about people of other faiths who live good lives but don’t profess a belief in Christ?” Graham replied, “I’m going to leave that to the Lord. He’ll decide that” (Los Angeles Herald Examiner, July 22, 1985). In 1993, Graham repeated this doctrine in an interview with David Frost. “And I think there is that hunger for God and people are living as best they know how according to the light that they have. Well, I think they’re in a separate category than people like Hitler and people who have just defied God, and shaken their fists at God. … I would say that God, being a God of mercy, we have to rest it right there, and say that God is a God of mercy and love, and how it happens, we don’t know” (The Charlotte Observer, Feb. 16, 1993). In an interview with Robert Schuller in May 1997, Graham again said that he believes people in other religions can be saved without consciously believing in Jesus Christ. “[God’s] calling people out of the world for His name, whether WHETHER THEY COME FROM THE MUSLIM WORLD, OR THE BUDDHIST WORLD, OR THE CHRISTIAN WORLD OR THE NON-BELIEVING WORLD, THEY ARE MEMBERS OF THE BODY OF CHRIST BECAUSE THEY'VE BEEN CALLED BY GOD. THEY MAY NOT EVEN KNOW THE NAME OF JESUS but they know in their hearts that they need something that they don't have, and they turn to the only light that they have, and I think that they are saved, and that they're going to be with us in heaven” (television interview of Billy Graham by Robert Schuller, broadcast in southern California, Saturday, May 31, 1997). What is Rob Bell saying today that Billy Graham hasn’t been saying for more than 30 years? C.S. Lewis (1898-1963) has been called a “Superstar” by Christianity Today. A 1998 CT poll rated Lewis the most influential evangelical writer, and In light of the wretched spiritual-doctrinal-moral condition of “evangelicalism” today, that is a very telling statistic and certainly no praise for C.S. Lewis. One of the ways that Lewis has influenced evangelicalism is in the fundamental issues of hell and the exclusiveness of salvation through the name of Christ. Lewis said that it would not be very wrong to pray to Apollo, because to do so would be to “address Christ sub specie Apollonius” (C.S. Lewis to Chad Walsh, May 23, 1960, cited from George Sayer, Jack: A Life of C.S. Lewis, 1994, p. 378). Lewis claimed that sincere followers of pagan religions can be saved without personal faith in Jesus Christ (C.S. Lewis, Mere Christianity, HarperSanFrancisco edition, 2001, pp. 64, 208, 209). In the popular Chronicles of Narnia series, which has influenced countless children, Lewis taught that those who sincerely serve the devil (called Tash) are actually serving Christ (Aslan) and will eventually be accepted by God. “But I said, ‘Alas, Lord, I am no son of thine but the servant of Tash.’ He answered, ‘Child, all the service thou hast done to Tash, I account as service done to me.’ ... Therefore, if any man swear by Tash and keep his oath for the oath’s sake, it is by me that he has truly sworn, though he know it not, and it is I who reward him’” (The Last Battle, chapter 15, “Further Up and Further In”). Lewis also denied the finality of one’s destiny at death. He taught the possibility of repentance beyond this life. This is the theme of The Great Divorce. “Is judgment not final? Is there really a way out of Hell into Heaven? ‘It depends on the way ye’re using the words. If they leave that grey town behind it will not have been Hell. To any that leaves it, it is Purgatory. And perhaps ye had better not call this country Heaven. Not Deep Heaven, ye understand’” (The Great Divorce). In this book Lewis taught that questions such as the finality of men’s destiny and purgatory and eternal destinies cannot be understood in this present life and we should not fret about them. “Ye can know nothing of the end of all things, or nothing expressible in those terms. It may be, as the Lord said to the Lady Julian, that all will be well, and all will be well, and all manner of things will be well. But it’s ill talking of such questions. ‘Because they are too terrible, Sir?’ ‘No. Because all answers deceive” (The Great Divorce, Kindle location 140-150). In light of these views, it is not surprising that Lewis has been cited as a major influence by evangelicals who are soft on hell and near-universalists. Clark Pinnock said, “When I was a young believer in the 1950s, C.S. Lewis helped me understand the relationship between Christianity and other religions in an inclusivist way” (More Than One Way? Zondervan, 1996, p. 107). Richard Mouw says, “If I were given the assignment of writing a careful theological essay on ‘The Eschatology of Rob Bell,’ I would begin by laying out the basics of C.S. 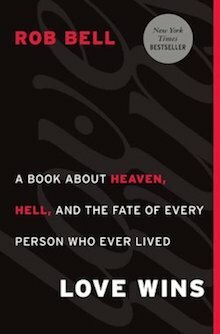 Lewis’s perspective on heaven and hell” (“The Orthodoxy of Rob Bell,” Christian Post, March 20, 2011). In the acknowledgements section of Love Wins, Rob Bell writes, “... to my parents, Rob and Helen, for suggesting when I was in high school that I read C.S. Lewis.” Beware of C.S. Lewis. That he is loved with equal fervor by “conservative evangelicals,” hell-denying emergents, Christian rockers, Roman Catholics, Mormons, and even some atheists is a fact that speaks volumes to those who have ears to hear. There is really nothing that Rob Bell is teaching today that was not first taught by C.S. Lewis.